Cambodia bicycle tours: cycling and biking in Angkor, Phnom Penh, Battambang, Kampot, Sihanoukville. 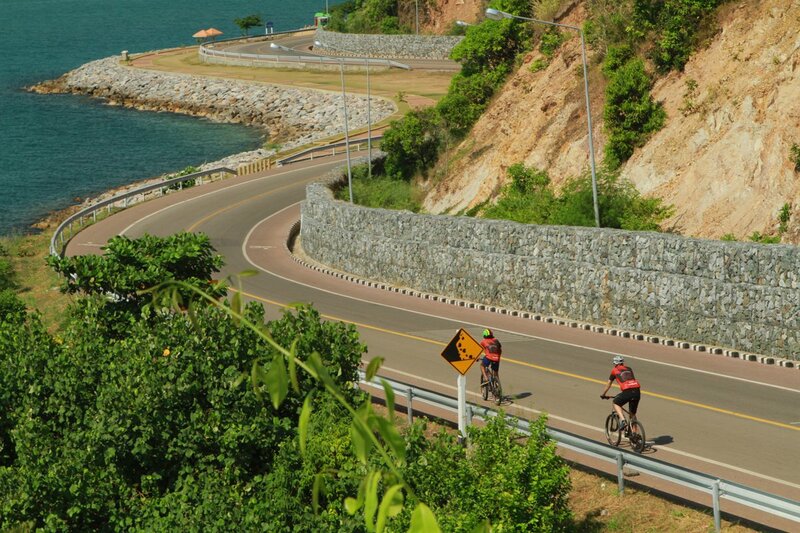 Our Thailand and Cambodia adventure is a fantastically varied cycle odyssey. Starting from the seaside in Thailand we cross over the border with Cambodia to the foothills of the Cardamon Mountains, From there we ride into rural Cambodia, discover the colonial outpost of Battambang, journey by boat across the Tonle Sap and ride through the world renowned temples of Angkor. Let our trusted Cambodian cycle and temple guides give you an interesting and a totally different way to visit Angkor. The added benefit of being on bicycle is that you will see more than the incredible legacy of the Khmer empire and get to glimpse into rural Cambodian life and meet the extraordinary and beautiful Khmer people. The ancient Khmer capital of Angkor is today one of the most remarkable and impressive sights in all of Asia. For much of its 600 years, the Angkor empire's regional power was unmatched, and under a number of its 'god-kings' such as Jayavarman the 7th the artistic exploits of the Khmer kingdom were unrivaled. In meeting the people in the countryside, you will begin to know the real Cambodia and the extraordinary and beautiful people of this fascinating country. Cambodia's recent embittered history contrasts starkly with the grandeur of the Angkorian past. Our journey shows you the cultural heritage and scenic highlights of Cambodia. Transfer to Soi Dao, a very scenic area in Chantaburi province. We em-bark on an afternoon ride to help blow away those travelling cobwebs. We ride to the Cambodian border through countryside rarely visited by foreigners. Once across the border, we ride to Pailin, set in the attractive Chour Phnom Kravanh foothills. We saddle up and ride through rural Cambodia along red dirt roads east to Battambang, a sleepy backwater full of charming colonial buildings. If water levels permit, we boat across Tonle Sap to the lost city of Angkor. We ride to the Angkor Temple complex before starting the Grand Circuit, stopping at each major temple area. At dusk, we return by car for a sun-set view from Phnom Bakheng. We enter the temple complex by a much quieter gate and ride into the countryside. We turn off the main tourist road to Banteay Srei, visiting Banteay Samre on the way. Cycle to the small village of Kro Bey Real and take in the countryside surrounding Siem Reap, as we head to the Tonle Sap for a short cruise through the floating villages before riding back to Siem Reap. Day 1 - Bangkok - Soi Dao Ride 25km. +198m / -200m. Really great trip: scenery, biking, food, and company. It was good to be in a small group – we could be nimble and adjust our daily plans as needed. Very high praise for our guide Kim Sampath: he was generous with his insights about the culture and the people, and highly knowledgeable regarding the many temples we visited. Plus it was a treat to have such an experienced cyclist showing us all the back roads and trails, in addition to the main routes. We had a GREAT time. Absolutely perfect to discover a country from another side! We thoroughly enjoyed the trip. Bicycling is a great way to experience a country. Without a bus window in the way, the sights and smells are more immediate and you can interact with people you pass. We enjoyed exchanging greetings with villagers and high fives with children also on bikes and getting a more intimate look at life in the countryside. Good food, good guides and the best way to beat the crowds and get a more peaceful meditative experience of the temples. Bicycling was a wonderful way to visit the Angkor complex. We were able to get away from the crowds and see aspects of the area that most people don't see. Our guide in Thailand, Mr. Pakorn (Korn) was a solid bicyclist and knowledgeable about the routes. Our guide in Cambodia, Mr. Ran Khemarak (Pheap), was a fun and engaging guide. Clearly loves cycling and guiding. Set good comfortable paces. He was good about reminding us to stay hydrated. We appreciated the pictures he took of us and posted on facebook. He adjusted plans when needed to meet our pacing and food requirements. He dealt well with food preference issues. He addressed bike maintenance issues competently and quickly. He checked in with all of his group regularly while riding - would drop back to join the slower riders sometimes, then speed up to take the lead again. He paid attention to all of us throughout the day. Our driver, Mr. Lee, was very attentive and helpful. He was always ready at each snack break with cool towels and fruit and made sure that all of our water bottles were topped off before the next ride. He was an attentive, careful and skillful driver. Our history guide in the Siem Reap area (Samol?) was excellent, knowledgeable, engaging. It was great that he was willing to bicycle along with us much of the way, providing more opportunity to learn informally from him. The fruit snacks provided by both teams (Thailand and Cambodia) were excellent. They always provided a good variety of very fresh interesting local fruits. The meals on our trip were generally excellent. We got to experience a wide range of Cambodian cuisine and most of it was excellent. The terrain is almost all flat, with some rolling hills in the foothills of the Cardamom Mountains. Although we cover some long distances, we usually only ride for four or five hours a day. There is a lot to see along the way as we ride alongside rivers and rice fields. Traffic is generally light, and we share the roads with ox carts and other cyclists more often than cars. Suitability: This trip has been designed to easy with only one day that is relatively hard. There are some undulations on Days 2 and 3, but nothing too difficult. This trip can is possible for anyone with a reasonable level of fitness. A support truck is always available to help when required. Biking Conditions: The roads are a mixture of tarmac, broken tarmac, and vehicle-width dirt roads. We depart from our meeting point in Bangkok and transfer to Soi Dao, a very scenic area in Chantaburi province, which borders Cambodia with only the Cardamon Mountains separating the two countries. This area is great for biking, and we have a chance to ride to help blow away those travelling cobwebs. We ride about 40 km to the border, passing through some beautiful countryside on our way. This is an area very few foreigners visit, and the pace of life is slow and relaxed – just right for a bike trip. After immigration and custom formalities, we cross into Cambodia and ride 17 km to Pailin, set in the attractive Chour Phnom Kravanh (Cardamom) foothills. The ride has some undulating sections, nothing to difficult, and the views of the mountains make for a very pretty ride. Pailin is now home to former Khmer Rouge leaders and also famous for its ruby mines. We saddle up and ride east to Battambang. This is very rural Cambodia with lots of mango orchards, corn fields, peanut groves, and, of course, rice paddies. We ride over good tarmac roads with some of the best views of the Cardamom mountains, one the wildest areas in Cambodia. We have lunch at Wat Phnom Sampeau, and after eating, we have a chance to visit the temple atop a limestone outcrop. Finally, we reach Battambang, Cambodia’s second city, a sleepy backwater full of charm and faded colonial buildings. 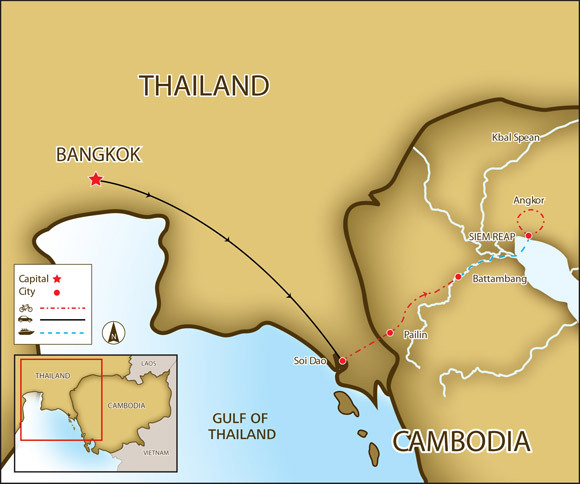 If water levels permit (usually from July to February), we journey by boat across Tonle Sap to the lost city of Angkor. The Great Lake is the beating heart of Cambodia, and we cruise past floating villages and sunken forests before arriving at Siem Reap. If water levels are too low, we'll take a short but fun journey on the infamous bamboo train before transferring to Siem Reap. This morning we ride to the Angkor Temple complex, entering from the south gate then traversing up tarmac roads and jungle paths until we reach our first temple, Tah Prohm. After our visit, we carry on through the jungle and toward the eastern gate of Angkor Thom, the ancient capital of the Khmer Empire. Near the centre of this massive enclosure, we find the enigmatic temple of Bayon. This temple is known for its many smiling faces. As the sun reaches its zenith, we take a short rest and lunch, before visiting the grandest temple of them all, Angkor Wat. Depending upon the time, we can choose to return to Siem Reap for a brief rest before going back to the Angkor complex where we’ll enjoy a beautiful sunset in Angkor Park before return to our hotel. Leaving Siem Reap by bike, we strike out for the countryside. Our initial destination is the village of Damdek, which lies not far from the temple complex. Once we pass through this quaint little village, we cycle down a narrow tarmac lane to Banteay Samre. Now we start getting deeper into the Cambodian countryside and pass many local villages and schools and people going about their day to day business. Ahead of us, the great sand-stone ridge of Phnom Kulen rises from the countryside. At the base of this mountain, we stop for lunch and take a short 3-km trek to Kbal Spean. Here we see ancient riverbed carvings of Hindu gods in the “River of 1,000 Lin-gas”. Once we finish here, we load up our bikes and transfer to Banteay Srei, the gem of the Angkor area known for its exquisite bas-relief carvings. Afterward, we transfer back to Siem Reap. We leave after breakfast to cycle to the small village of Kro Bey Real and another chance to ride in the countryside surrounding Siem Reap. After, we head to the Tonle Sap and take a short cruise through the floating villages. (If water levels are too low to visit the floating village, we will visit the Roulus group of temples). On our return, we ride on the opposite bank of the river passing through many local communities before arriving back to end our tour in Siem Reap. The bikes you will be riding are Trek mountain bikes with lightweight alloy frames, 24- to 27-speed gearing, v-brakes, and Shimano components and front suspension.